Experiencing authentic traditional Japanese cuisine is reason enough to travel all the way to Japan. For those interested in high-dining, Japan has three of the top ten cities with the most Michelin stars in the world (#1 Tokyo, #2 Kyoto, #4 Osaka). For those interested in more budget-friendly options, the culture of eating and drinking with co-workers in the evening has created thousands of izakaya – or Japanese style pubs – across the country. Japan is a foodie’s delight. However, foodies with disabilities still face many barriers when trying to find accessible restaurants. Japanese food is typically eaten with chopsticks, but chopsticks can be very difficult – if not impossible – to use by people with disabilities affecting their hands. With more and more foreign tourists visiting Japan, it is now much more common for restaurants to have a fork or spoon available for those who cannot use chopsticks. However, this is still often not the case. Many restaurants will either not have western utensils, and if they do have them, they may be child-sized versions for kids. This is particularly true for sushi restaurants. We recommend that you carry a set of utensils with you when traveling. You can buy a package of disposable forks/spoons at most 100 yen shops or you can ask the clerk at a convenience store for one after a purchase. However, the best option might be to buy a travel set like this one from Amazon: Sistema To Go Collection 4 Piece Cutlery Set . Drinking straws are typically available, but, again may be to small to reach the bottom of a beer. You may want to carry a few straws with you just in case. If you want to try your hand at chopsticks, but don’t have the dexterity, there are still a few options. FUN CHOP Chopstick Helper , or alternatively Pro Chops , are options that are very portable. They are a small piece of molded plastic that can turn almost any pair of chopsticks into a pair of tongs by sliding the chopsticks provided by the restaurant into the slots and squeeze to pick up food. However, some users have said that they had trouble at restaurants in Japan since the chopsticks were either too thin or too thick to properly fit into the slots. Though slightly bigger to carry, there are a number of options for assisted chopsticks that are full chopsticks and don’t rely on the chopsticks provided by the restaurant. This way you can get used to them before you leave and don’t need to worry about any surprises or incompatibilities. Items like Compac Holdstix or Edison Training/Helper Chopsticks might better serve your needs. Carrying these items can make the difference between a great dining experience – be sure to pack them! 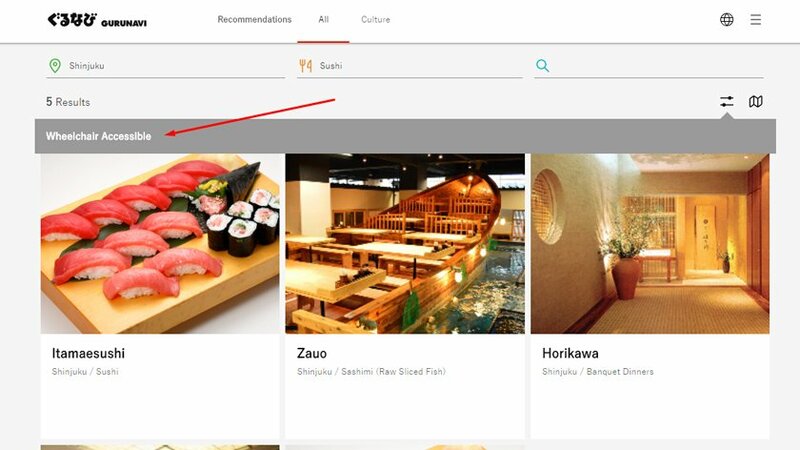 Finding accessible restaurants in Japan can be very difficult. The small buildings, cramped interiors, and use of steps like the genkan can make many restaurants completely inaccessible. This unfortunately seems to be the case for traditional Japanese restaurants more so than Western imports. While it is possible to wander around until you find something, we suggest you use one of the following websites. Knowing accessibility information beforehand is reassuring and encouraging. 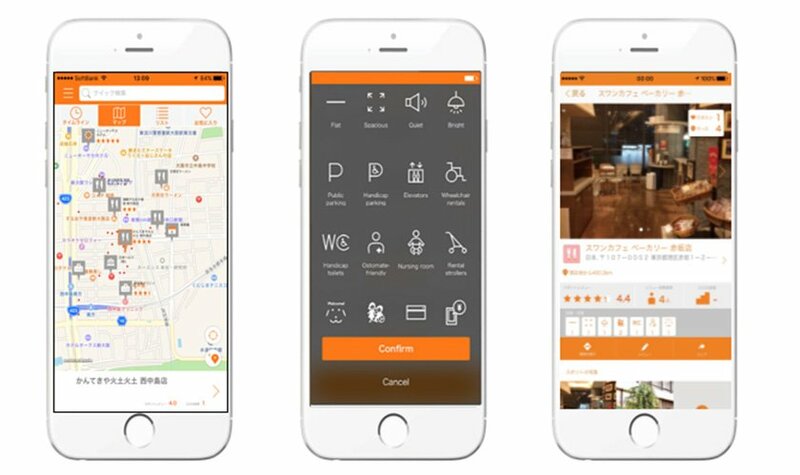 With the voices of persons with disabilities as driving force, Mirairo Inc. developed an app called “Bmaps” for collecting and sharing the accessibility information of places of interest, such as restaurants, shops and public facilities. Persons with various types of disabilities were involved in the development of Bmaps. Based on their ideas, the accessibility information to be featured on Bmaps was narrowed down to the following 19 items. In addition to the information on physical accessibility such as the number of steps at the entrance and the availability of a wheelchair-accessible toilet, the spot information includes other features useful for a wider group. For example, whether the place is quiet or not. Some people who are sensitive to noise or persons with visual impairments who prefer a quiet environment may find this information useful. Persons with hearing impairments may prefer an environment where they can see sign language better, so they may want to know whether it is well lit or not, which can be an important factor for older persons or persons with low vision. Information on payment options are useful for anyone, including foreign tourists as well as persons with visual impairments who may prefer making payment by card. Using Bmaps is easy! Anyone can download it for free (https://bmaps.world/en) on PC, iOS or Android. It’s available in Japanese, English and Spanish. Users can click on the map to review a spot and select accessibility features. They can also upload photos and leave comments, which are extremely useful for others. The search function of Bmaps helps users find if there are places near them that meet their accessibility requirements. GURUNAVI (“Gourmet Navigation”). 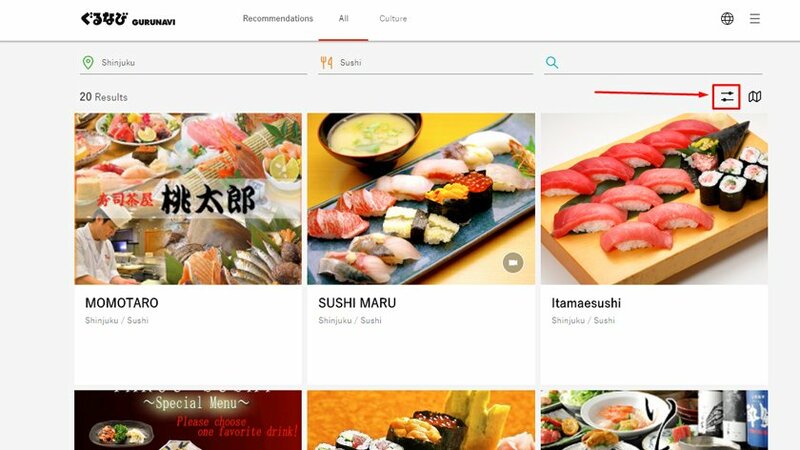 It is a Japanese website similar to Yelp! 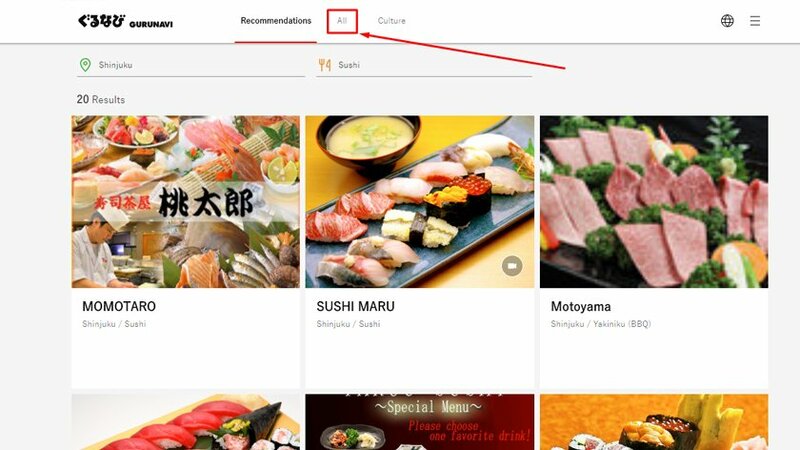 and lists thousands of restaurants in both Japanese and English. 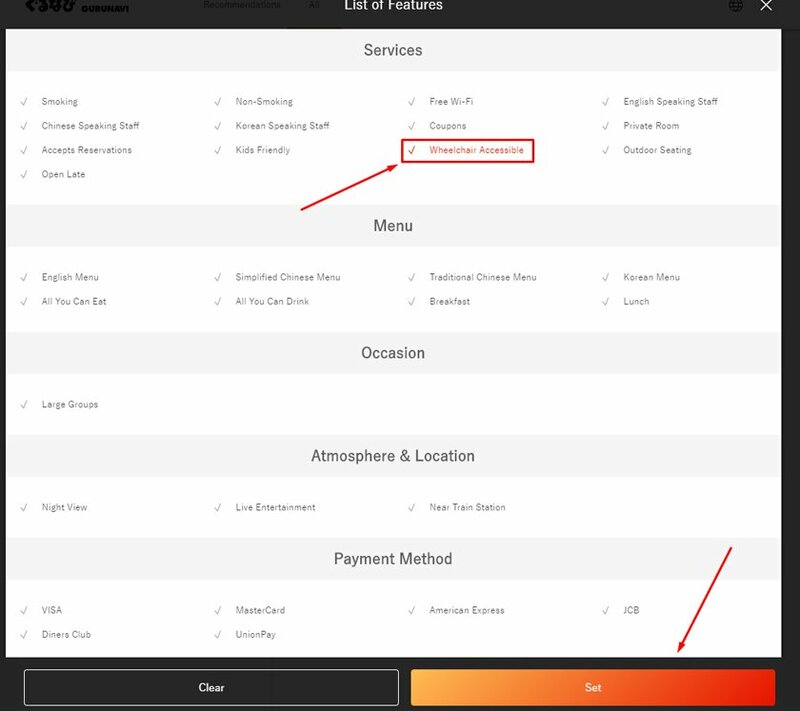 The key to using it to find accessible restaurants is unfortunately slightly hidden. 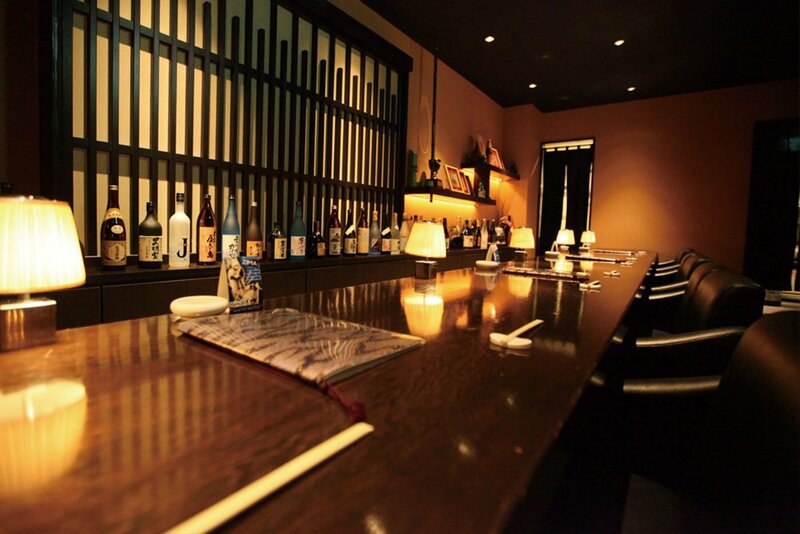 After you have made a search like “shinjuku sushi”, it will show you recommendations. Since you cannot filter these, click on “All” at the top. Unfortunately, this resets your search, so you will need to chose an area and food type again. After searching again, click the filters button at the top-right of your search results. Select “Wheelchair Accessible” (and any other filters you want) and then click “Set”. After setting your filters, you can see the results that meet your requirements. Keep in mind that Gurunavi likely does not check all the restaurants for accessibility in the same way a person with a disability might, so in some cases there may be a discrepancy between what the restaurant owner believes is accessible and your requirements for accessibility.